Increased quota for commercial nearshor rockfish Really!!! Why? Response: Am I dreaming, or Is it April Fools day? Are we rewarding the commercial fishermen for reducing the bag limit for recreational fishermen??? This notice details in-season increases to two-month cumulative trip limits for Periods 5 & 6 in 2018. Landings of Black Rockfish and Greenling in the commercial nearshore fishery are running low. These increases will allow additional opportunity to attain larger portions of state harvest guidelines. Trip limits for Blue/Deacon Rockfish, Other Nearshore Rockfish and Cabezon need to be held at Period 4 levels to minimize chances of exceeding those harvest guidelines. ODFW will continue to track landings in-season and make additional adjustments as needed.  All other Nearshore Fish species combined: 15 pounds per day, not to exceed 25% of total landing by weight or cumulative trip limits for permits with a Nearshore Endorsement (below). Complete current Oregon Administrative Rules can be found at www.dfw.state.or.us/OARs. Click COMMERCIAL FISHERIES OTHER THAN SALMON OR SHELLFISH for OAR 635-004-0270 through 635-004-0365. *You must have a nearshore endorsement to land more than the incidental amount of Tiger and Vermilion Rockfish. Landings of these species apply toward each fisher’s federal shelf rockfish trip limit, and not toward the state trip limits or annual harvest guidelines. Does ODFW have any Idea how this looks to the fishing public??? THE BIGGER QUESTION DOES ODFW KNOW HOW TO MANAGE THE FISH SPECIES COMMON TO THE MARINE INVIRONENT? For example the ODFW allows the largest quota for CABEZON during the period of greatest spawning activity. In addition the ODFW allows recreational fishermen to catch and retain surfperch when they enter Oregon's bay each spring to give live birth. ODFW is using the breeding habits of Cabezon and surfperch to satisfy the greed of both commercial fishermen and recreational fishers to by harvesting those fish species when they are most vulnerable. We object to the short gains of easily caught fish that are challenging the long term benefits of sustainability of Cabezon and surfperch. Thanks for keeping us updated. Were you able to contact ODFW Marine Resources to share your thoughts? We have and ODFW refused to reconsider the additional information supporting our request to limit retention of pregnant surfperch. Click on the link at the bottom of the page to read the letter from Dr. Braby. Dear Dr. Braby, We request that ODFW reconsider your position denying our request for the implementation of a Surfperch Management program based on the additional information provided. The ODFW study entitled, "FINAL REPORT - SOUTHERN OREGON SURFPERCH STUDIES." The study discusses the decline of redtail surfperch within the framework of current ODFW management practices. Comment: In addition pregnant redtail surfperch are easily identified when they enter Oregon’s bays while the males remain outside along the ocean beaches. The female perch enter Oregon’s bay to give live birth and are easily identified because of their swollen bodies and should be returned unharmed to the water. The information contained in the documents provides a measure of support for the implementation of surfperch management program. The decline of redtail surfperch alluded to in the ODFW study, “FINAL REPORT – SOUTHERN OREGON SURFPERCH STUDIES” has already occurred and is documented in the dissertation of Karl G. Bookins as occurring from 1979 – 1988. Being an avid fisherman I vividly recall the declining abundance of redtail surfperch during the identified period. Our rational: Each year ODFW has to cut the number of rockfish anglers are allowed to retain. This year the bag limit for Nearshore rockfish was reduced to 4. In addition the recreational quota for Cabezon was met and the fishery closed. The quota for Cabezon allowed by commercial fishermen was greatest when the fish were breeding. Harvest Practices for Rockfish, Surfperch and other Related Marine Finfish Species. We strenuously object to the ODFW practice of allowing the harvest of marine fish species while the fish are pregnant or spawning. We object to increasing the commercial catch quota for rockfish species. We further object to the harvest practice of allowing recreational fishermen exploitation of the retention of pregnant surfperch from Oregon's bays. The following quote is from ODFW increasing the commercial quota for Nearshore rockfish species. The comments at the end of the paragraph are mine. Our objections are based on the following: for example, ODFW allows the largest quota for commercial harvest of CABEZON during the period of greatest spawning activity. ODFW's policy of killing breeding rockfish species and seaperch is enforced by their wiliness to allow the exploitation of our rockfish and surfperch species when the fish are spawning or in the later stages of pregnancy. We request that ODFW reconsider the retention of female surfperch when they enter Oregon's Bay each spring to give live birth based on experience of fishermen and the following information. The ODFW study entitled, "FINAL REPORT - SOUTHERN OREGON SURFPERCH STUDIES." The study discusses the decline of redtail surfperch within the framework of current ODFW management practices. Click on the attached document to view the Final Report. Comment: In addition, pregnant redtail surfperch are easily identified when they enter Oregon’s bays while the males remain outside along the ocean beaches. The female perch enter Oregon’s bay to give live birth and are easily identified because of their swollen bodies and should be returned unharmed to the water. Correction: Recreational fishermen have not lost quota to commercial fishermen. Commercial fishermen were not able to fill their quota, so the quota for some fish species was increased. HOWEVER, The point is our marine species of fish stocks are not being managed. Society is targeting pregnant fish or fish that are spawning. Are we killing the future generations of our marine fish stocks? Shopping at your local market offers surprises and objections to harvesting and marketing of Oregon's Rockfish. Question Did Pacific Seafood Dumps Rockfish on Market ? Did Pacific Seafood take advantage of the increased rockfish quotas to put rockfish on sale at rock bottom prices to move the excess rockfish harvest? Tyler, It is time to take a hard look at how Oregon manages the harvest and marketing of It's rockfish species. Conclusion. there are more holes in the management of rockfish than substance!!! 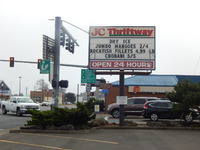 The Photo of JC Thriftway Market in Newport billboard advertising Rockfish on sale. Dear OSP, please consider the following complaint. Pacific Seafood Dumps Rockfish on Market? 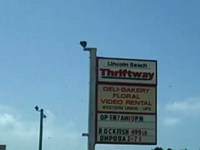 Click on the red colored text to view the video clip of the billboard advertising Rockfish on sale. ODFW increases the Commercial quota for rockfish on 09/01/2018 and then on 09/12/2018 local markets are selling rockfish at the rock bottom sale price of 4.99 a pound for Rockfish they purchased from Pacific Seafoods. If Indeed ODFW's claim of rockfish running low is true, then how is it that just in little more than a week later Pacific Seafoods is able sell rockfish at sale prices? ORS's govern the increase in the rockfish quota. The unanswered question is there truth in ODFW's claim justifying the increase for the commercial quota for taking rockfish? Or was it a sham to benefit commercial fishers and processors? We are asking the OSP to investigate to confirm that ODFW's increase to the rockfish quota was honest and forthright. Thank you, William Lackner for the members of the Clam Diggers Association of Oregon. We look forward to the results of your investigation. The daily bag limit for general marine fish (rockfish, greenlings, skates, etc.) will go back to 5 fish per angler per day, beginning on Wednesday, September 19. The combination of the reduced bag limit from July through mid-September reducing catch of black rockfish, and some additional yelloweye rockfish quota from the Pacific Fishery Management Council is allowing the bag limit to return to 5 fish for the remainder of the year. Lingcod remains at 2 fish, flatfish at 25 fish, and longleader gear at 10 fish (of 8 specific rockfish species). The recreational bottomfish fishery will also be able go to all-depth beginning on October 1 as planned pre-season. Reminder: Cabezon is closed for the remainder of the year. For additional information see the ODFW Sport Bottomfish Webpage. Q: What are the commercial regulations governing the take of lingcod in the territorial waters of the federal government? A: Lingcod fishing is federally regulated in all waters off Oregon from shore out to 200 miles. The state of Oregon adopts federal regulations for lingcod fishing by reference. Current commercial trip limits, area restrictions, and other federal regulations are online at www.westcoast.fisheries.noaa.gov/publications/fishery_management/groundfish/public_notices/nmfs-sea-18-05-revised.pdf. The federal groundfish fishery is intensively managed and the large amount of information at the link above reflects that comprehensiveness and complexity; we would be happy to assist with interpretation if necessary. As an example, for open access non-trawl fishing in the area north of Cape Mendocino, California, see Table 3, which begins on page 12 of the document at the link above: fishing is allowed shoreward of 30 fathoms and seaward of 100 fathoms (closed between those depths to avoid yelloweye rockfish bycatch), and the trip limits are 300 lbs per month from December through April, and 700 lbs per month from May through November. Q: Is there a separate quota for the commercial catch and the recreational catch? A: Yes. Q: Is commercial fishing for lingcod allowed during the breeding period in both state and federal waters? A: Yes, commercial (and recreational) fishing for lingcod is allowed year-round in state and federal waters. Q: If any, what percentage of breeding male lingcod removed from the nest constitute bycatch to other fisheries? A: Very little lingcod catch is bycatch at any time of the year; lingcod is a highly desirable species and is targeted in both recreational and commercial fisheries. Q: Is it safe to assume that all male lingcod caught during the breeding period consist of breeding fish? If not, what percentage of the male lingcod were breeding males? A: No. While lingcod are known to spawn and then males guard the egg nests in winter months (peaking from January through March), not all males are guarding nests at that time. It is not possible to tell from catch sampling whether a lingcod was guarding a nest or not when it was caught. In addition, there are recent indications that some lingcod may spawn multiple times year-round, so there is not a single, clearly-defined “breeding period”. Q: What are the consequences to the overall population of lingcod by removing the male lingcod guarding the egg nest? A: For an individual egg nest, male nest guarding is imperative to prevent predation. In the big picture at a population level, if the removals are limited and enough lingcod remain on their nests to ensure an adequate level of reproductive success, then there is no negative consequence to the population. In other words, not all nests need to survive…just enough to produce enough new lingcod to support a healthy population size. The most recent stock assessment (2017) found that lingcod off Oregon and Washington are abundant and productive, with an estimated spawning stock biomass well above the size needed to maintain the population over the long term while continuing to support fishery harvest and ecosystem needs. The spawning stock biomass has been on an increasing trajectory since it was at a low point in the mid-1990’s. This growth indicates that the current management approach (including allowing regulated harvest year-round) has been effective and can safely be continued into the future. We note your objection to “increasing the commercial catch quota for rockfish species” in which you refer to our recent public notice of increases to the two-month cumulative trip limits for black rockfish and greenling in the commercial nearshore fishery. We would like to clarify that the overall catch quotas have not changed, only the trip limits have. Annual catch limits and fishery harvest guidelines are the controls that cap the total amount that can be caught each year; these are set before the start of each year (or every two years in the federal process) and are not changed in-season. Trip limits do not cap total catch, they are simply a mechanism to spread it over a desired fishery season length (year-round, in the case of Oregon’s commercial nearshore fishery). In addition, you state that “catch rate is declining”. This is incorrect. Overall catch in the commercial nearshore fishery has been lower than expected this year, but not catch rate. Catch is simply the sum of all commercial landings; while catch rate is the amount of catch per unit of effort (such as a fishing trip). Catch has been down this year because effort has been down; i.e., not as many fishing trips have been taken as expected. This could be because fishermen have been pursuing other opportunities such as crabbing or other fisheries, and/or because of weather and other factors. On the fishing trips that have occurred, the catch-per-trip has not declined—in other words, the fish have not been harder to find. Increasing the trip limits for allows each fishermen who is active in the fishery this fall to harvest more fish individually, but the cumulative catch will not be allowed to exceed the overall annual quota (which has not changed). The trip limit increase will benefit those fishermen who are choosing to fish this fall, their communities, and seafood consumers. Regarding your comments on allowing the recreational catch of pregnant surfperch in bays and estuaries, we note that overall fishing effort targeting surfperch appears to be low compared to the area of surfperch habitat, and also low during much of the year. There is not a current stock assessment for surfperch; however, we believe that the current management measures and harvest practices are appropriate. We would like to clarify that the August 28 notice to commercial groundfish and processors you cite is regarding only the trip limits for black rockfish and greenling in the commercial nearshore fishery (described above). There are other, non-nearshore species of rockfish, which are abundant and support large annual catch limits, that are harvested in the federally managed midwater trawl fishery; for example, widow rockfish and yellowtail rockfish. Rockfish selling for $4.99 per pound in a grocery store as you observed is almost certainly trawl-caught midwater rockfish, as our commercial nearshore fishery generally supplies smaller specialty markets and restaurants. This notice details in-season decreases to Cabezon trip limits for Periods 5 & 6 in 2018. Landings of Cabezon in the commercial nearshore fishery are running very high. As of September 21st, or 72% of the season, the fleet has attained 89% of the commercial state Harvest Guideline. Trip limit reductions are necessary to increase the chances Cabezon remains open to some retention all year. These trip limit changes apply only to Cabezon landed after 10/4. Trip limits for other species groups are not affected by this in-season action and will remain at levels specified in the 9/1/2018 industry notice. ODFW will continue to track landings in-season and make additional adjustments as needed. All Nearshore Species INCLUDING CABEZON: 15 pounds per day, not to exceed 25% of total landing by weight or cumulative trip limits for permits with a Nearshore Endorsement (below). - Period 5, September-October: 500 pounds per period and 15 pounds per day – this implements a daily trip limit effective 10/5. *Fixed gear vessels without a limited entry Black and Blue Rockfish permit may retain only 15 pounds of nearshore species per day. See the back side for the nearshore species list.